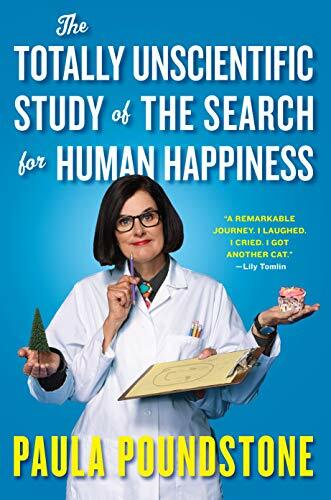 Fans of Paula Poundstone’s dry humor and offbeat view of the world should enjoy her new book, The Totally Unscientific Study of the Search for Human Happiness. Set up as a series of scientific experiments broken down into field notes, hypotheses, and qualitative observations, Poundstone presents her mission to find the most sustainable sources of happiness, trying everything from getting physically fit to volunteering, to both connecting and disconnecting with the world. As is true of her stand-up and her appearances on NPR’s Wait Wait . . . Don’t Tell Me! Poundstone has a unique point of view to her humor but is also highly relatable. In her search for happiness through social media, she describes the uniquely modern feeling of having life experiences influenced by one’s knowledge that they will likely post about the experience later on social media. It’s a phenomenon few have discussed, but rings quite true. Though her self-deprecating style allows the more mundane pursuits to be entertaining, it’s her offbeat humor that provides the biggest laughs, such as when writing about the addictive nature of social media she mockingly compares the anxiety and horror of being unable to connect to the Internet to the horrors endured by the lost boys of Sudan. Much of her quest for happiness revolves around her children; such as renting a fancy car knowing that her son would also enjoy it, or taking her disabled daughter on a hiking trip. Their experiences are also very relatable, like when her son is mortified about her idea to find happiness through hugging, “’Oh mom, don’t.’ You’d think I had told him I was going to run naked through his history class,” she writes. There are also glimpses into the life of a traveling comic, dividing time between promoting and performing in shows and going to hospitals to visit wounded veterans. While the concept of the book—an admittedly unscientific search for happiness—likely necessitated the format; sometimes the format breaks up or takes the reader out of the stories a bit. Possibly free essays about each quest would be more engaging. Those those looking for scientific insight into the search for happiness might not be satisfied, but for readers who want a break from the current madness in the world and a good dose of Poudstone humor, this book will certainly provide. Kristen Hansen Brakeman is an essayist whose often humorous work has appeared in such venues as the New York Times, the Washington Post, Working Mother Magazine, LA Parent Magazine, and Huffington Post.